During the second world war, Britain’s nuclear physicists were deployed in research directed towards winning the war. Many were engaged in developments associated with radar, (or ‘radio-location’ as it was then called), both at Universities and at Government Laboratories, such as TRE and RRDE at Malvern. Others contributed to the atomic bomb programme, both in the UK, and in the USA, mainly at Los Alamos and Berkeley, and at Chalk River in Canada. Besides contributing directly to the design of the bomb itself, British physicists were actively involved in other aspects, such as the techniques required for uranium isotope separation, and instrumentation to detect blast and radiation effects. Towards the end of the war, when victory seemed assured, the nuclear physicists began looking towards the peacetime future. The construction of new particle accelerators to achieve even higher energies was seen as one of the more important possibilities. Those working at Berkeley on the electromagnetic separator were familiar with the accelerators there, and exciting possibilities were immediately apparent. Indeed, even before this, Marcus Oliphant, while working on the electromagnetic separators at Oak Ridge, had put forward the idea of a ring magnet with frequency increasing with magnetic field to preserve synchronism, however to make a very high energy machine a practical proposition it required the invention of phase stability by Edwin McMillan in 1945. His idea was to accelerate protons to an energy of the order 1 GeV, where he guessed that quite new phenomena would be observed. 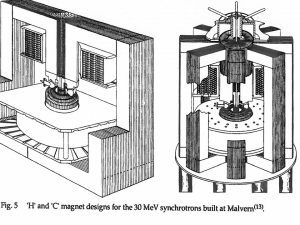 There was much discussion of different linear accelerator concepts, and Dr L H Gray estimated that up to six machines with voltages of the order of 30 MeV might be required for medical purposes, but there was at present no great interest in further cyclotrons. So the synchrotron project seemed dead from the beginning. After this time events moved rapidly, especially at the newly established Atomic Energy Research Establishment (AERE) being set up on a disused wartime airfield at Harwell and minds had been changed as by the end of the year design and construction of a synchrotron of energy 30 MeV was being considered. Not all the physicists returned to their Universities after the war, some remained in government service and joined the Atomic Energy programme under the direction of John Cockcroft. 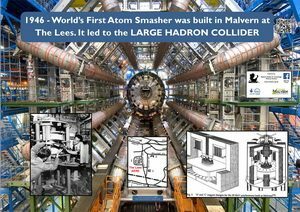 The AERE physicists also wanted to build and use accelerators, and they had the advantage that many of the skilled technical staff at Malvern who were keen to transfer, as well as those returning from Deep River in Canada. The staff working on the synchrotron remained temporarily at Malvern, together with those on the linear accelerator project and those in the electronics division, under the overall direction of Dennis Taylor. The question of the extent to which AERE staff could involve themselves in ‘curiosity oriented’ research as well as ‘mission oriented’ research directly relevant to the power and weapons programmes was a vexed one, and occasioned some argument, especially between Cockcroft and James Chadwick, who had returned to Liverpool University after his wartime role as Director of the British contribution to the bomb, under the code name of the ‘Tube Alloys” project. 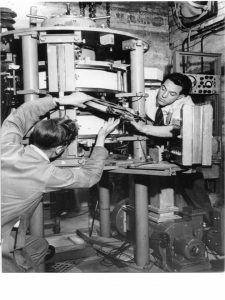 By the end of 1945 a programme for synchrotron research had been outlined and it was agreed to start by building a machine at 30 MeV. This was partly to explore the design and operation of synchrotrons before embarking on larger projects, but it was recognized that interesting physics could be done with 30 MeV electrons and X-rays, such as studies of y-n reactions and nuclear photo-disintegration. Further, interest was expressed by the medical community in the potential application to cancer therapy. So a group was assembled at Malvern under Donald Fry, who had been in charge of the microwave aerials group at TRE. These early discussions had naturally involved the electrical engineering industry, in particular the larger companies, Metropolitan-Vickers, English Electric and British Thomson-Houston (BTH). In 1945 the TRE work on radar had started to be moved from Malvern College down the hill to ‘The Duke’, previously a Naval Station. 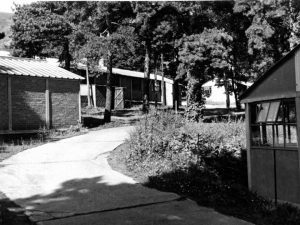 one outpost remained, however, ‘The Lees’, a small self-contained area outside the main College grounds where huts had been erected to house the top secret countermeasures group. It was here that the synchrotron and linear accelerator were to be built and housed, together with the electronics group under Taylor, designing equipment specifically for Harwell. Recruiting staff for these new enterprises was vigorously pursued, and three key members of the synchrotron group soon moved into the Lees to start work there. In overall charge of the synchrotron under Fry was John Gallop, an electrical engineer with industrial experience needed for large scale items such as the magnet and its power supply. John Dain, from TRE, was to take responsibility for all the electronic controls and circuitry; Frank Goward, an expert in aerials from TRE was in overall charge of the physics, and the original team contained three others from TRE: John Wilkins and Herbert Payne were responsible for the resonator and RF system, and Herbert Watson was in charge of all vacuum aspects and the injector gun. Supporting this team at Malvern was the mathematician William (Bill) Walkinshaw, a member of the Harwell Theory group under Klaus Fuchs (who in 1950 was unmasked as a Soviet spy). Goward realized that the betatron at Woolwich, which had been used to examine flaws in amour plate using penetrating X-rays, this could be converted to a synchrotron. This required increasing the magnet current, so that saturation occurred earlier in the cycle, and building a resonator around the vacuum chamber (or ‘donut’) in the form of a shorted quarter-wave line with a gap in the inner conductor, tuned to a frequency equal to the speed of light divided by the circumference of the orbit. At the betatron energy of 4 MeV the electron velocity was already within 1 % of that of light. Then, just as the iron begins to saturate, the RF would be switched on, accelerating the particles by means of the electric field across the gap to a higher energy. The machine was moved to Malvern, and by replacing the coils, adding air cooling and providing a DC bias field it was possible further to increase the energy to 14 MeVd. The X-ray intensity was greatly improved also by increasing the injection energy from 2 to 20 KeV. With these modifications it was used both for general experiments on synchrotron operation, and for experiments on medical applications. Extensive studies were made of the distribution of ionization in materials simulating human tissue, with various filters and collimators. This system in 1946 confirmed the practicality of synchrotron acceleration and provided a basis for the design of the 30 MeV machine. Construction of the first machine was well under way, and delivery of the magnet was expected during 1947. In January 1947 a fairly detailed specification of the parameters and work required had been prepared by Goward, Gallop and Dain. It was envisaged that several machines would ultimately be needed, and that these would be built by English Electric, who were building the magnet for the first one, to be assembled at Malvern. Two magnet designs were considered, an ‘H’ magnet and a more symmetrical ‘C’ magnet; eventually both types were constructed. The H magnet had the advantage of accessibility to the vacuum chamber but was less economical and less likely to produce a field with good azimuthal uniformity. Since access was considered very important in initial experiments, the H magnet design was chosen for the first machine. Both designs as ultimately built are shown below. The year 1947 was occupied not only with building and commissioning the machine but eventually after some problem delayed the delivery of the magnet until mid-1947, the first beam was obtained in October, making it the world’s first operational synchrotron. It is interesting to note that experiments at Malvern, using the 30 MeV machine, were carried out on aspects of the ideas of Sir George Thomson, who was working on controlled thermonuclear reaction in a toroidal tube containing plasma isolated by a magnetic field. The idea led to the premature announcement of thermonuclear fusion electricity reactor generation by Zeta (Zero Energy Thermonuclear Assembly) in the 1957. 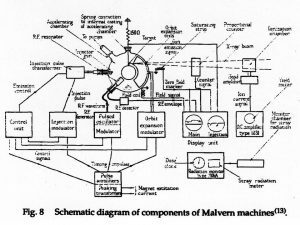 The synchrotron programme at Malvern was terminated at the end of 1950. By this time it was realised that linear accelerators provided a more intense, reliable, and accessible beam for physics experiments and medical work for energies up to 30 MeV. Another reason was that the Korean war had started, and priorities returned to defence. A number of staff, including the author, were abruptly moved to defence related work. The original H magnet 30 MeV machine, with extracted beam, was transferred to University College, London, but proved unreliable and was abandoned. The C magnet machine was moved to Harwell where photo-disintegration experiments continued for a short while, after which the machine was sent to Melbourne University. 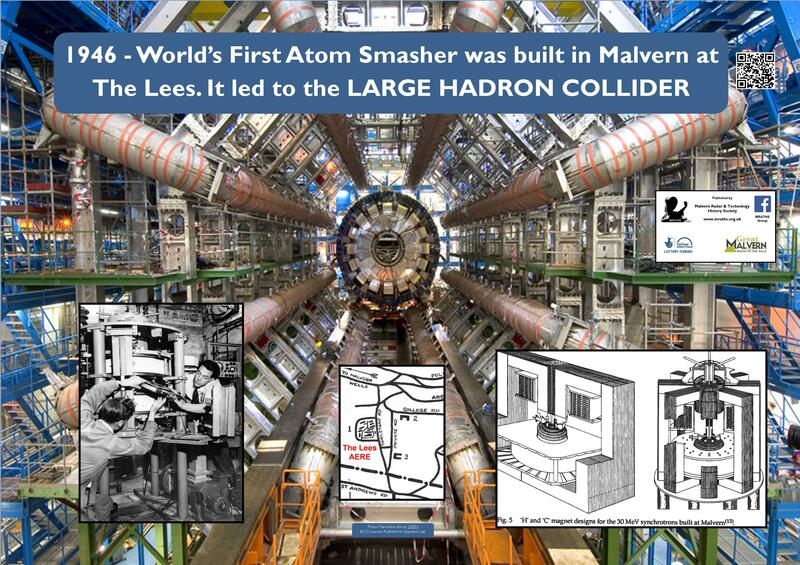 At Harwell interest shifted to the possibilities of a large national proton machine, and to early ideas for CERN. Which lead, many years later, to the Large Hadron Collider.